California’s historic drought is affecting farmers and consumers with there’s no relief in sight. >>> and state officials in california say the historic western drought is not a coming crisis, it's a current crisis and the impact is already being felt at farms and local businesses. and unless the weather shifts dramatically, it will only get worse, nbc, mike taibbe has more. >> reporter: here, the drum beat of bad news, the quickly shrinking reservoirs, spelling disaster for more on this growing season . >> the industries as a whole will be affected, at least three years because of this situation that we're in right now today. >> reporter: he has been relying on county water for irrigation and has not been shut off yet. 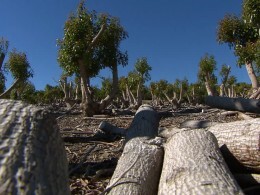 and has even cut off older, more thirsty less productive trees to save additional water. but all the elements of the drought are at historic extremes. january rain days, usually california 's wettest month, zero, january wildfires, last january there were none, this year? 406. snowpack amount, a mere 12% of normal. >> nobody can remember anything like this being nothing like this has happened in over 100 years. >> reporter: and it is not just farmland that is at risk. unless there is a dramatic and unanticipated weather turn around, several counties say they will run out of drinking water in two months, in marin county north of san francisco ? >> we have asked customers to conserve. >> reporter: voluntary now, but that will change if the weather does not. the impact is spreading, a 25% price jump for locally grown food at some markets, a bait and tackle shop relying on water, hanging on for dear life . >> we're doing our rain dance and praying for rain. >> reporter: there have been rain and snow dances, catholic bishops have asked the faithful to pray for rain , and are trying to inspire extra rain or snow with the clouds. but the skies, for too long, in what is supposed to be the rainy season , have been a beautiful blue. >> this is the wrong time of year to be beautiful. >> reporter: with no relief on the horizon, mike taibbe, california .